In keeping with our pledge to prepare children for kindergarten, Stepping Stone School has recently adopted a Learn-to-Read Curriculum for our Advanced Pre-Kindergarten Classes. The Bob Books were chosen based on their reputation for supporting reading readiness in young children and their adaptability for use in whole group and small group settings. Through daily practice, children will build pre-reading and reading skills that are foundational to a lifetime of reading. Our wonderful teachers have undergone training on the use of these books and have learned various reading strategies to assist the children through the reading process. Our teachers read to the children on a daily basis so that all children develop phonological awareness (letter and sound relationships), an awareness of print (taking notice of writing in the environment and developing an understanding of the functions of print), and an understanding of the concepts of print (reading left to right, top to bottom, and that print conveys a message). 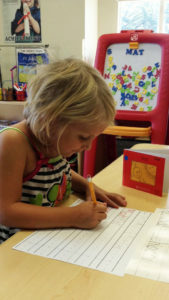 The teacher works with all children to develop pre-reading skills through letter identification and the recognition of letter-sound relationships. 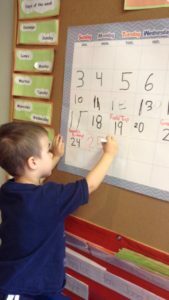 After a child demonstrates the ability to identify most letters and letter sounds, he or she works with the teacher in a one-to-one or small group setting using the Bob Books. At the beginning of each Bob Book is a letter/sound dictionary which introduces the letters and sounds that the child will encounter throughout that particular book. The teacher works with the child to identify these letters and sounds and then walks the child through putting the sounds together to read the words. Each of the Bob Books builds upon the skills learned in the previous book allowing for steady progress towards reading goals. Following each story, the teacher and child discuss what happened in the story to build comprehension skills. Then the child and teacher re-read the story together to reinforce the newly learned skills and allow the child to build upon previous successes in order to gain confidence in his or her reading ability. Our teachers have been trained to encourage and praise any and all efforts made by the child, but know to take a break if the child expresses hesitation or frustration. Our goal is for the children of Stepping Stone School to build a strong foundation in reading in order to develop a lifetime love of reading. We understand that all children develop at different rates and therefore look for the signs of reading readiness before introducing the Bob Books to individual children. Please talk to your child’s teacher or campus principal if you have questions about this process. As parents, you can prepare your child for learning to read by reading to them on a regular basis. As you read with your child, point out how the pictures support the words in the story, look for individual letters, and talk about the letter sound relationships. After reading a story talk about what happened in the story and ask your child to describe his or her favorite part of the story. Through these activities, you will reinforce the various skills your child is working on in the classroom.